Noticing a horse and cart on Nefyn beach on a postcard recently kindled my own recollection of horses and carts on Nefyn streets. There were not many in my days since that era had ended in the 1920’s a couple of decades before I was born. Tractors were being used on farms instead of workhorses, and lorries were being used on streets instead of horse and carts. But even in the late 1940’s, a few older individuals were still hanging on to the things they were used to from their younger days. One of those individuals was Wil Blor, an unforgettable Nefyn character. Will was a tall man with a craggy face, a slight stoop, and, to me as a youngster he seemed loud and brash. He made a living with his horse and cart hauling material from one place to another - sand, stone, and seaweed off the beach etc. He also worked on farms spreading manure, and doing odd jobs in the fields. Earlier in life, he apparently worked at Gwaith John Lloyd, a quarry on the mountainside above Nefyn. There was plenty of work there for haulers since Gwaith John Lloyd, in contrast to the larger quarries at Caer Nant, Bird Rock, Bodeilias, and Gwylwyr, had no mechanized means of transporting the granite. The other quarries had large steel cars, automatic winches to move those cars on rails up and down the mountain, and jetties or piers out to sea to load the granite directly on to ships. Gwaith John Lloyd had to rely on the horse and cart haulers to move their granite, and perhaps that was okay since most of it was for local house building use. When the quarry finally closed in 1937, Wil Blor was somehow or other “left on the mountain” so to speak. He must have had some screws loose somewhere. He lived in a little stone walled building where the blasting powder for the quarry was kept or where the workers took cover when blasting was in progress. In Welsh, the little building was referred to as “cwt powdwr”. It was a ramshackle of a building measuring approximately twelve by twelve and six feet high with a dirt floor, a corrugated roof, and loose sacking hanging over the door. How he lived there, one can only imagine. There was no running water, and rainwater was collected in a barrel as it came down off the roof. He burned dried gorse for heat, and there was a pile of it outside the door. Smoke would emit from a piped chimney in the corner of the building when he was ‘home’, and had a fire going. It was pathetic by any modern-day standards. The building was accessible off the road to Mynydd Nefyn, past Trem-y-Don, turning left on to Lon Josyn, and then bearing slightly to the right into the Gwaith John Lloyd property. It was also accessible via the public footpath going up the mountain at the far end of the Bryn Mynach field. White triangle markers show Wil Blor's cwt powdwr near the Gwaith John Lloyd Quarry and Sionyn's thatched cottage. Foreground shows the Fron, Nefyn with the old Seion Baptist Chapel. Wil had relatives in the area. But he apparently adamantly refused any efforts to move into more comfortable surroundings, much to the consternation of those involved. He would visit his relatives on Sunday, because on that particular day he was always clean-shaven and spruced up. He would have on a white shirt with no collar, and a very poorly fitting black suit. The suit had a greenish hue to it, probably from the smoke and the dampness. The suit would only reach half way down his forearms, and the trouser legs were way too short, highlighting a pair of heavy hob-nailed boots. He was a very religious man, he never drank, and he faithfully attended services in the Methodist Chapel on Well Street every Sunday. He fancied himself as an evangelical preacher like the famous Tom Nefyn Williams who lived locally. Wil would try and emulate Tom Nefyn by preaching the Gospel on Nefyn Square, but somehow he did not have the charisma, the charm, or the eloquence to draw a crowd. His horse’s name was Dica, a large brown colored shire workhorse. The cart was open with no sides, and Wil would sit on the edge of the cart off to the side from the horse’s rear end. That was a good move, since they would plod around Nefyn with the horse messing up the streets with steaming piles for the street cleaner to shovel up. In earlier years, Wils horse and cart would be parked on the Square acting as a taxi for English visitors arriving on the old omni-bus service from the railway station in Pwllheli. 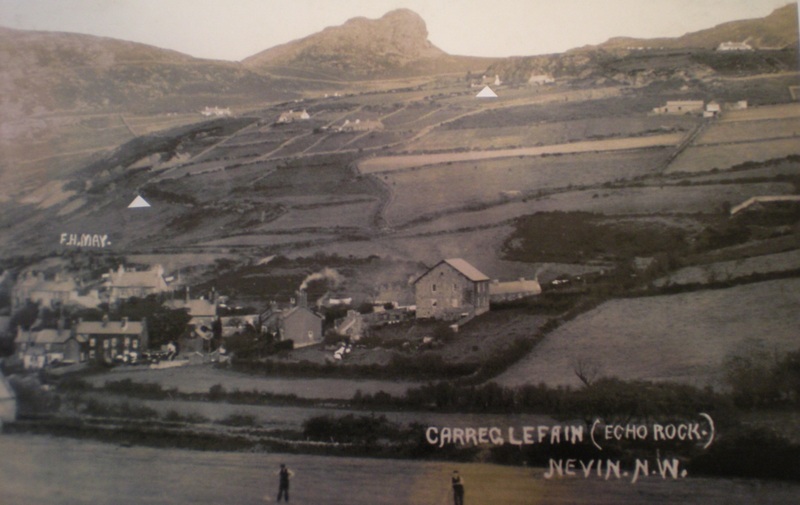 Most visitors in those days were for the large houses in the Nefyn West End or Nefyn Beach. Wil would load their baggage onto his cart, and while he sat on the cart, the visitors would walk behind to their destination. He could not converse in English very well, but sufficient to be understood, I guess. I remember one day my father, Dei Fron, and my Uncle Bob laughing in stitches outside my grandmother’s house in the Fron after Wil told them the story of how he had reprimanded some children in English for sitting on a wall somewhere in Nefyn. Wil thought the wall was a little fragile. He told them bluntly, “Top of the wall is on the floor, then coron to pay, myn diawl! !” What he meant to say was that if the wall fell over, it was going to cost their parents five shillings to fix it. On that day, Wil and Dica had brought up some stones and sand from the beach for Dei to repair a hole in the cobblestone pavement outside my grandmother’s house on Fron Terrace. I was only about eight years old at the time, and I remember my mother and I side-stepping around Dei and Wil as they did the work, and being a little intimidated by Dica out on the street. Those cobblestone walkways were everywhere in Nefyn then, and they were really nice looking. They consisted of oval stones measuring around six inches diameter, and one inch thick. There are literally thousands of those sized stones on the beach around Nefyn Point and towards Bodeilias. An entrepreneurial young Nefyn man should start a business reintroducing those pavements. The stones were placed in a bed of sand, stacked together tightly, and mounted on-end to form the walkway. They were pleasant perhaps even therapeutic to walk on, and the only issue was that weeds and grass would grow between the stones. That shouldn’t be a problem these days with easy to spray weed killers. Cobblestones were eventually replaced with granite setts, and even though those setts were manufactured in local quarries, they were rarely used around Nefyn. They were for export only, I guess. Those cobblestones walkways in Nefyn were eventually concreted over like everything else. Anyway, back to the story of Wil Blor and Dica. Twm Gydros, yet another character, would often use Wils services to bring logged trees off the Garn Boduan mountain behind the town. Twm was an exceedingly strong man. He would cut the trees down, saw them into sizable logs, and literally roll the logs down the mountain into the Ty’n Coed Valley below. He would carry those heavy logs on his shoulders through town to where he lived in Tai’r Lon. When the load was too much, he would have Wil and Dica come over and drag the logs through the streets. Dica was often left grazing in the field in Bryn Mynach, or in Ddol, the current parking lot next to the closed Seion Baptist Chapel. My father told me that Dica died suddenly in the field in Bryn Mynach. It took a long time to dig its grave nearby (there were no mechanized diggers around in those days), and by the time the hole was completed rigor mortis had set in. Unfortunately, the workers hadn’t dug the hole deep enough, and when they manipulated Dica over into its final resting place, they shockingly found that its hooves were sticking up way above ground level. Of course, it was too late then. They couldn’t dig the hole any deeper with poor Dica already in there, lifting Dica back up was out of the question, and the rigor mortis was preventing them from bending its legs. They concluded that they only had two options. They either had to build a mound sufficiently high to cover the horse’s hooves, or they had to get a butcher over to do some work. I won’t tell you which option was selected. Will Blor passed away in the early 1950's. His "cwt powdwr" residence was back in the Nefyn spotlight a couple of years later when a local teenager absconded from an approved school, and somehow made his way back to the Nefyn area. While the teenager was evading the authorities, he took up residence in "cwt powdwr". His grandmother was spotted taking him food there through Bryn Mynach, and Jones the local bobby was dispatched on to the mountain to try and catch him. A large crowd, myself included, gathered on Nefyn Square from where "cwt powdwr" was clearly visible, to watch the drama and the chase unfold. When the teenager saw the police approaching on Lon Josyn, he hid behind "cwt powdwr" and then he took off up the mountain. From the Square, we could see easily where the teenager was, and where the police were, but with no means of communicating, PC Jones just had no chance to catch him. The teenager completely outfoxed the police by dodging and sprinting behind the stone walls in the fields around Tai'r Ffolt, and he eventually disappeared over the top of Mynydd Nefyn. He was apprehended later in the day by the police at Efail Newydd, and returned to school. Another person with a horse and cart that I used to see in the Fron all the time was Guto Fron Fawr, the farm above the Fron just below Garn Boduan. Guto had a small pony (merlan bach) and cart, which he used to deliver milk to customers all over Nefyn. This was in the days just after WWII when pasteurization and sterilization of milk had not yet been established as a requirement all over the country. Guto had a couple of large milk cans on the back of the cart with a tap in the front from which he would fill jugs and pails with fresh milk for his customers. I would notice him coming down the hill in the Fron in the morning walking slowly by the side of the pony, and encouraging it to take it easy on the steep hill. Once on the flat though by Tan-y-Fron, Guto would sit up on the cart next to the milk cans, flip the reins, and away they would trot into town. Coming back up the hill after his deliveries, Guto would get off the cart and walk up to minimize the load. Those horses and ponies were really well taken care of since their owners often depended on them for their livelihood. On the side of the roads, near the hills around Nefyn, there would be concrete troughs with running water for the horses to drink. One was located near where the toilets are now located half way up Screw Road. Another trough was located on the right below Trem-y-Don, where the wall on the back of Tan-y-Dderwen ended, and where the stream from Dderwen flowed under the road. A couple of other real winners were Sionyn Modrub and Jack Bach. Sionyn lived in the only thatched roof house in Nefyn. The house was part of a smallholding owned by Sionyn, and it was located on the mountain just below Garndderwas. A pony and cart was a necessity in such a smallholding. Sionyn would grow a large amount of vegetables in one of his fields, and he would use the pony and cart to sell them around town. He used to deliver vegetables to Mrs Taylor a widow who lived in the Maes. The local blacksmith was located directly across the road from her house in Cefn Maes where the horses and ponies were regularly shod. I used to have a job on Saturday mornings delivering groceries from Mrs Owen’s Shop on Pen-y-Graig, and when I delivered to Mrs Taylor house, Sionyn was always there. He was a bachelor, and I think she used to feed him. After finishing work, I would go up to the Fron, tell my grandmother that Sionyn was in town, and she would then have me buy some vegetables from him as he passed by at Tan-y-Dderwen. Jack on the other hand lived on a large, more modern farm outside town. He would also bring his produce into town for sale, but he would use a tractor and cart. My mother would buy vegetables from Jack since he often passed our house in Glan-y-Pwll. Both Sionyn and Jack enjoyed, let’s phrase this correctly, more than an occasional pint of beer. You would often find Jack’s cart and tractor parked outside the Sportsman or in front of the Nanhoron Arms Hotel. I remember when Jim Bentley (owner of the Nan at the time) and my father arranged a highly publicized contest between Sionyn and Jack to see who could grow the largest carrots. The contest was held in the Bar on the right side of the Nan one evening in the autumn. My father made up some posters for the occasion with caricatures of both contestants, and the posters were hung on walls inside the Bar. Sionyn’s caricature showed him with a huge oversize carrot on his little cart, and with his poor pony struggling to hold back the cart as it came down the mountain. Jack’s caricature, on the other hand, showed him sitting comfortably on his tractor, pint in hand, and the cart loaded with huge bundles of carrots and turnips. They nominated an impartial judge to do the adjudication. Twm Gydros even turned up for the celebration that evening, and although Twm was a very strong individual, his tolerance for alcohol was exceedingly low. After the night was over, Hughie Ensor and some friends ended up taking Twm home in a wheelbarrow. I won’t tell you who won the competition, but poor Sionyn lost his way going back home up the mountain and finished up sleeping in a field. And Jack with his cart and tractor were all over the road heading out of town – thank goodness his highest speed was only about five miles an hour. This was, of course, long before strict driving-under-the-influence laws, and breathalyzer tests became the norm. That was one humdinger of a ‘night to remember’ in the Nan in Nefyn. Another person who lived in the house next to Sionyn Modrub on the mountain was Walter Cae Glas. Walter was the local chimney sweeper, and in the early days Sionyn used to lend his pony and cart to Walter so he could get his equipment on site. I don’t recollect that, but I do remember when Walter was tragically killed. He was doing his chimney sweeping work at Ffrancon and Bessie’s house opposite Edeyrnian, when he accidentally fell off the chimney. He suffered a fractured skull and died in hospital in Bangor the following day. 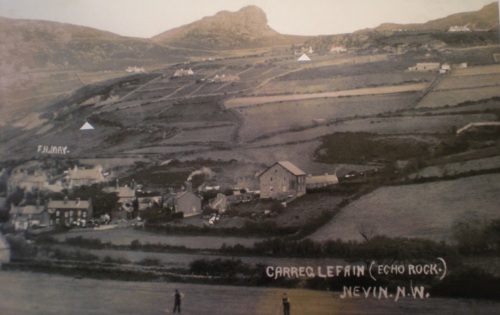 Such was life growing up amongst some wonderful, really down-to-earth characters, and some left over horses and carts in the town of Nefyn in the 1940’s and 1950’s.